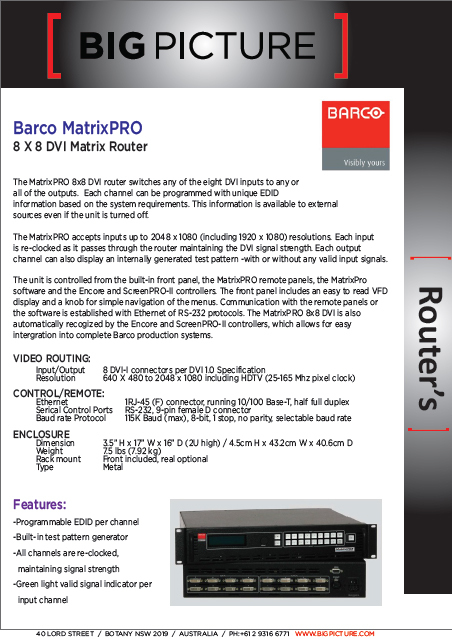 The MatrixPRO 8×8 DVI router switches any of the eight DVI inputs to any or all of the outputs. Each channel can be programmed with unique EDID information based on the system requirements. This information is available to external sources even if the unit is turned off. The MatrixPRO accepts inputs up to 2048 x 1080 (including 1920 x 1080) resolutions. Each input is re-clocked as it passes through the router maintaining the DVI signal strength. Each output channel can also display an internally generated test pattern -with or without any valid input signals. The unit is controlled from the built-in front panel, the MatrixPRO remote panels, the MatrixPro software and the Encore and ScreenPRO-II controllers. The front panel includes an easy to read VFD display and a knob for simple navigation of the menus. Communication with the remote panels or the software is established with Ethernet of RS-232 protocols. The MatrixPRO 8×8 DVI is also automatically recogized by the Encore and ScreenPRO-II controllers, which allows for easy intergration into complete Barco production systems.